1. Stir together milk, chocolate and butter over medium heat until mixture starts to leave the sides of the pan. 2. It should look like a thick paste. Let cool just long enough for you to be able to handle it. 3. 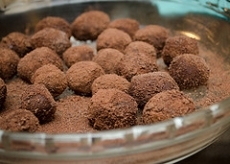 Shape into walnut size balls and roll them in the chocolate sprinkles.